Amazon today announced spate of new Kindles in addition to an extension of its Kindle self-publishing program with Kindle Serials as part of a grand press event held in Santa Monica, Calif.
Kindle Serials let authors publish books as installments, akin to classic serial novels from the time of Charles Dickens. Users will purchase the novels upfront to receive the first chapter, with new chapters added as free automatic updates as soon as the author publishes them. It's not entirely clear if a delay will be implemented to simulate the serial novel experience for those who purchase a story after several installments are published. Users can also provide feedback to authors, which scribes may or may not appreciate to varying degrees. The program will launch on Kindle with eight titles, priced at $1.99 each. The initial serial novels will comprise a range of genres, including yoga mystery "Downward-Facing Death" and "Hacker Mom." 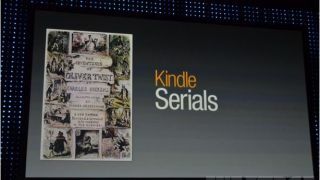 As an homage to one of the best known serial authors, Charles Dickens' "Oliver Twist" and "The Pickwick Papers" will be republished for free through Kindle Serials in their original segments, complete with their original covers and illustrations. Authors can self-publish on Kindle Serials as an extension of Amazon's Kindle Direct Publishing initiative. Amazon revealed that 27 of the top 100 books on Kindle are self-published through the KDP program. The program lets authors keep ownership of their book copyright, and offers a 70 percent royalty on copies sold through the Kindle store. Amazon billed Kindle Serials as a modern take on publishing during its press conference, but the concept is really more of a throwback to a bygone time in fiction. Either way, the return of serial novels is a welcome one that should open up new doors both for authors and readers looking for their next quick fictions fix.